See below for detailed directions starting from London Heathrow Airport, Oxford, The West, The North and alternative routes and also Google map and Satnav / GPS position of the Cottage. The Cotswolds lies bounded by the M40 and M5. If coming from London Heathrow, follow the signs for the M25 orbital road northbound. After about 10 miles the M40 northbound towards Oxford and Birmingham is clearly signposted. Stay on the motorway for around 40 minutes. Where the motorway indicated the A40 to Oxford on the left, come off the motorway and follow the signs to Oxford. After approximately 7 miles there is a large roundabout. Continue to follow the A40 signs north along the Oxford northern bypass road. At the second roundabout turn left at approximately 11.00, following the A40 signs to Cheltenham. Follow the signs north for the A40 to Cheltenham. Turn along the A40. Stay on the A40 for approximately 20 miles until a roundabout is reached at the entrance to Burford. The righthand turn is indicated to the A424 to Stow-on-the-Wold. Drive down the hill through Burford and cross the bridge at the bottom, bearing left at the roundabout along the A424. Either approach along the A40 and turn right at the Burford roundabout and follow the instructions below. Alternatively, approach from the A429 through Bourton-On-The-Water. 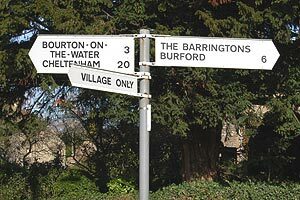 Once on Bourton, follow the road out marked towards Westcote and the A424. Just beyond the outskirts of the village there is a road on the right with a brown sign for The Lamb Inn. After about 2 miles that road comes into Great Rissington. Follow the road up the hill and round to the left to the village green. Drive past the Lamb Inn and follow the road marked "Village Only" as above. Sign for The Lamb Inn. Approach either from Stow on the Wold, following the signs to Burford on the A424. 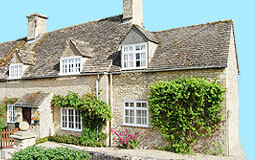 Approximately 3 miles out of Stow a righthand turn to Little Rissington will appear. The follow the instructions in the second paragraph below. The most picturesque route to Great Rissington is to continue straight on towards Taynton and Great Rissington immediately after the roundabout where the A424 commences from Burford and starts to climb towards Stow. However it is a narrow road liable to some flooding, although the rewards are a drive through Taynton and Great Barrington. 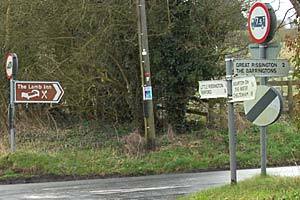 The alternative is to follow the A424 round to the right and stay on it for about 8 miles until a turning to Upper and Little Rissington appears on the left. This route is a less arduous drive, but involves some doubling back. For the first route, stay on the road through Great Barrington, and turn right at the T junction in Great Barrington and follow the road for about 5 miles until Great Rissington is signposted on the left. There is also a brown sign for "The Lamb Inn". If taking the second route, follow the road through Upper Rissington, but be careful to turn left at the junction with the road to Little Rissington. Do not go to Little Rissington,. 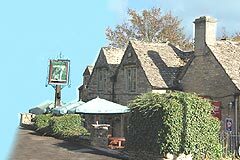 Stay on the road for about 3 miles until a righthand turn marked Great Rissington and the Lamb Inn appears. 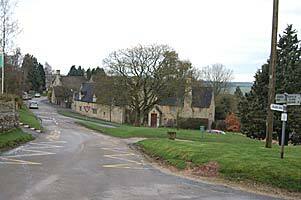 In both cases, follow the road into Great Rissington itself, about 0.75 miles, at which point the village green will be on your right. Continue past the green along the road signposted "Village Only". Keep driving down the gentle hill until you see a red postbox on your right. Easterleigh cottage is next to that postbox. Follow the road on the left and the cottage will be found 1/4 mile on the right, next to a post box.